Hi folks, Doc here. 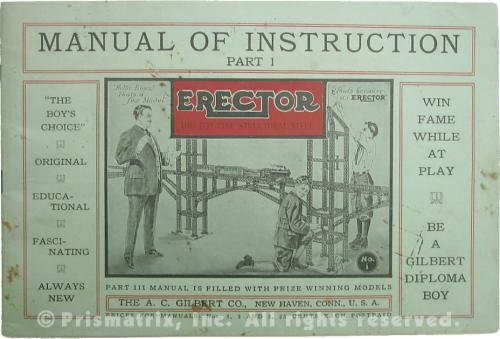 This time we'll look at another one of the earliest Erector sets, the No. 4 set from 1916. 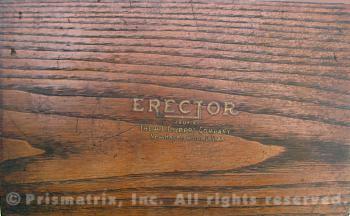 In that year, only the fourth year of Erector production, Gilbert made changes to the No. 4 set. The set contained fewer than the previous year's No. 4 set. It also featured a new decal on the lid that was unique to the No. 4 set and was only used until 1919 (the so-called "Style IV" decal). Finally, the No. 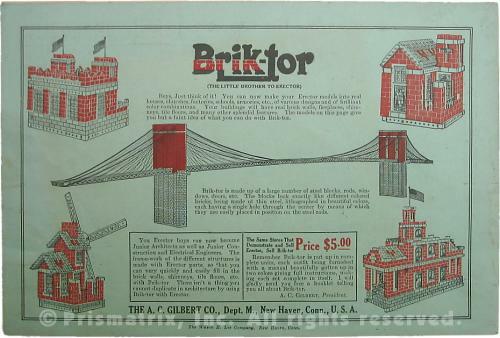 4 set, like the rest of the 1916 sets, included a new instruction manual with a cover printed on light green paper (see photos below). The No. 4 for 1916 contained 401 parts (see the inventory list at the bottom of the page), and was advertised to build 278 different models. It was typically packaged in an oak box, as with the set shown in this feature, although Gilbert also offered the No. 4 set in a cardboard box this year. The wooden box measured 13" long by 8" wide by 3" tall; a parts inventory sheet was pasted on the underside of the removable, shoe box style lid (see photo at right). 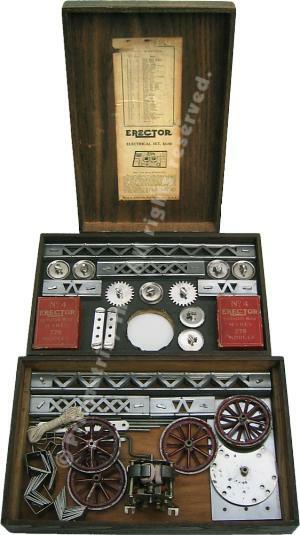 Inside the box, the set featured larger quantities of the same selection of parts as the smaller No. 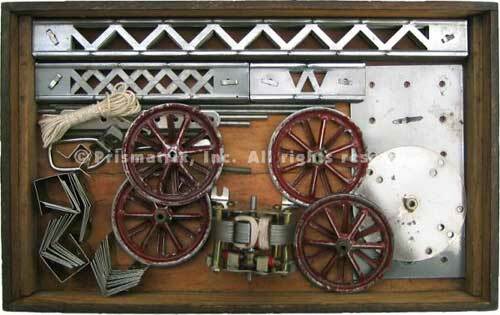 3 set, including the new and improved girders and pulleys that were introduced in 1914, plus a P58 motor and contact strip. 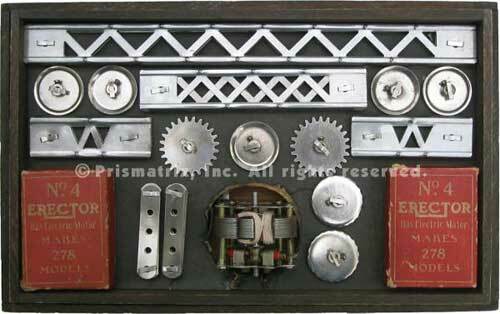 As the photos on this page show, the parts were arranged in two layers; the upper layer was a removable shallow wooden tray with a cardboard liner to which various girders, pulleys, and gears were attached with paper fasteners (t-clips). A large round hole was cut into the liner and tray in order to accomodate the P58 motor, which stood in the bottom of the box. Beneath the tray, the remainder of the parts, including more girders, plus wheels, baseplates, discs, angle brackets, etc., were arranged lossely in the box around the motor. Screws, nuts, and other small parts were stored in two red cardboard part boxes on the upper tray. The particular set shown in this feature contains an original manual, part boxes, lid decal, and cardboard tray liner, plus all original parts.